FreeDB is one of the largest music databases that can be accessed freely on the Internet. Users can access the website to search for artists, bands, albums or music genres and the service is used by several mp3 taggers and CD rippers to automatically add the correct information to the music files. FreeDB Grabber is a free software program that has been designed as a desktop frontend for FreeDB. 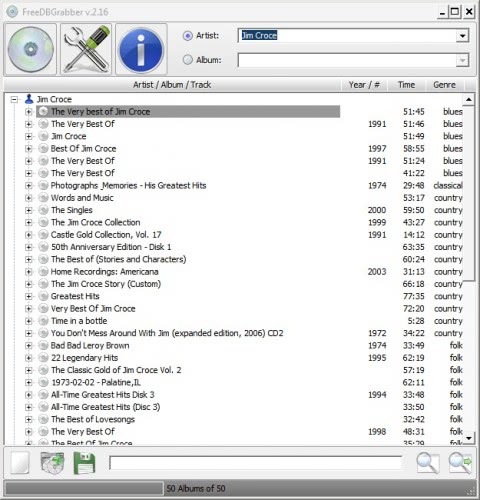 The software can be used to display albums and song information about artists that are entered into the search form provided in the application. Search results are sorted by singer, albums and tracks with additional information displayed for each album and song including the playtime, genre or year it was released. It is furthermore possible to perform a search in the results that have been provided by FreeDB or export the information into dbz or rtf format. The default value of 50 search results can be changed in the program's options. The main use for the program is to quickly lookup information on the local computer system. The FreeDB website limits search results to ten per page with details only accessible after left-clicking on the details button on the website. FreeDB Grabber is a free software program for the Windows operating system. A version for Pocket PCs is also being provided on the developer's website.